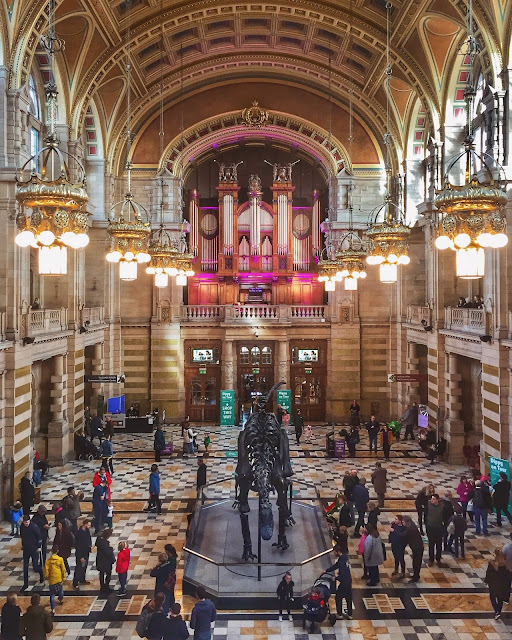 Now, the main reason I wanted to go visit now in particular, is because the Natural History Museum in London has sent their Diplodocus skeleton model, named Dippy, on a tour of the UK, and it's in Glasgow until the start of May. I thought this sounded so cool, so it was a good excuse to go while it was still there. And it did not disappoint - my word, that thing is huge! It fills up the entire centre hall of the building, with over 200 bones forming the entire skeleton. The original was excavated in the USA in 1898, and acquired by Scottish-American Andrew Carnegie, for the Carnegie Museum in Pittsburgh. When the British King Edward VII expressed interest, Carnegie had this plaster of paris replica made, and gifted it to the Natural History Museum in 1905. 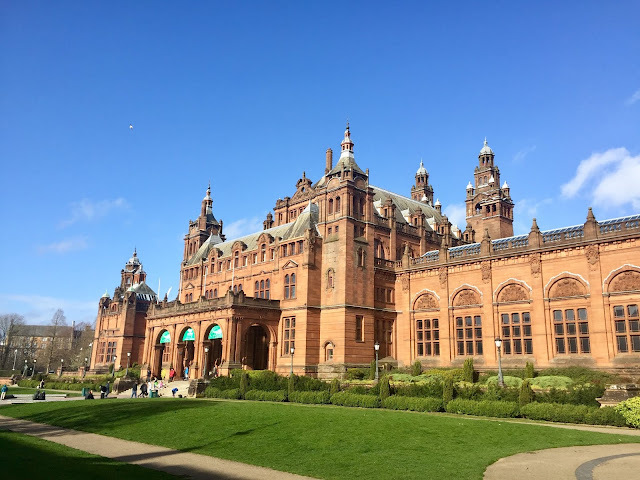 This is the first time they've toured it around the UK, and the Kelvingrove is a great venue for it as well, as the building is stunning. 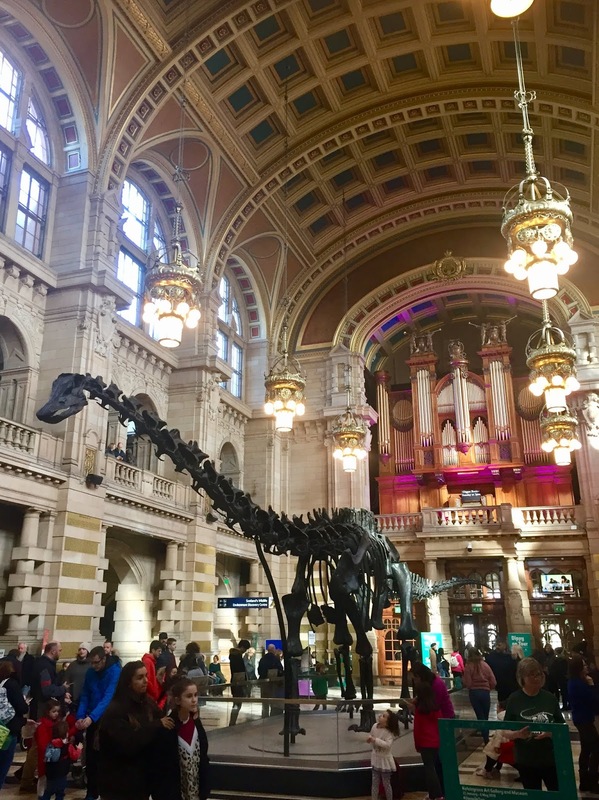 In the centre hall, Dippy is surrounded by high vaulted ceilings, balconies from the first floor, and the organ takes centre stage on the north wall behind it. 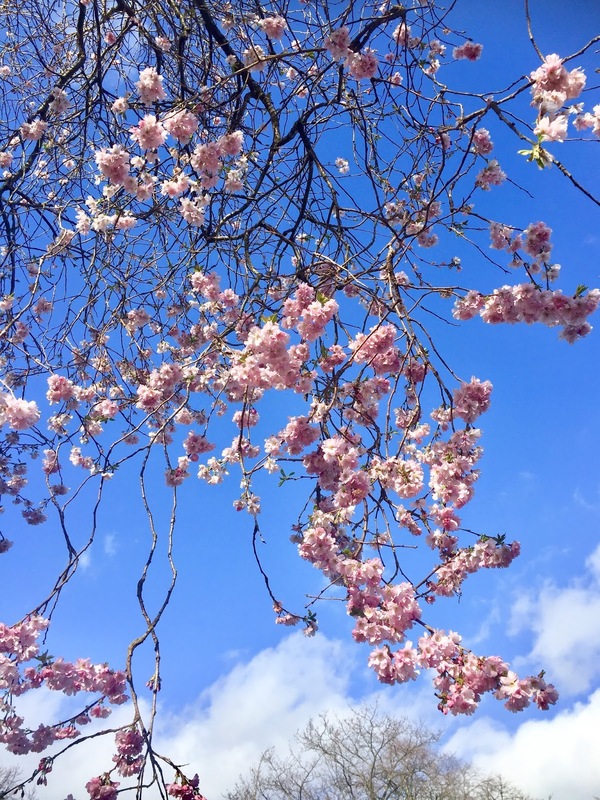 I spent a long time just admiring it and taking photos from all angles. Then, I also revisited shortly before leaving the whole building, as on Sundays there is an organ rectal at 3pm, so I caught a little of that, with Dippy in front of me again, before I left. I did make sure to explore the rest of the galleries as well, taking advantage of not having a million kids to supervise myself. The Kelvingrove is part art gallery and part museum, with a very diverse range of topics and exhibitions to explore. 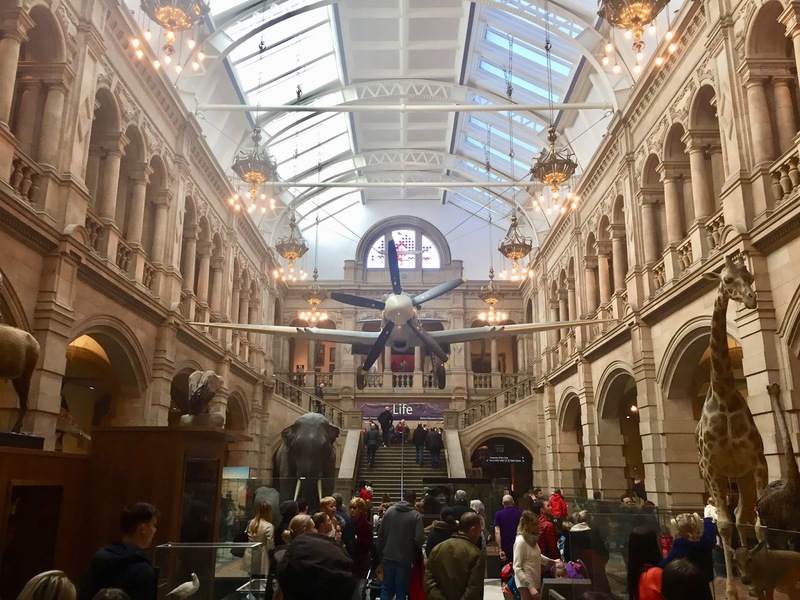 There was a special temporary exhibition downstairs first of all, featuring sketches done by Leonardo da Vinci, showcasing his artistic flair as well as his creative invention ideas. It was crazy to think that these sketches are five hundred years old! There are also permanent rooms on Scotland's First People, Glasgow Stories, and exhibitions on prolific Scottish artists, like Charles Rennie Mackintosh, and the Glasgow Boys. But then there's also Ancient Egypt, Creatures of the Past, Conflict and Consequence, and French and Dutch artists. Of course, there are floor plans provided, but it's also kind of fun to just wander ad be surprised by what each new room has in store for you. There's so much to see as well that of course, I couldn't stop and read every single piece of information in depth, as I'd have been there for hours! 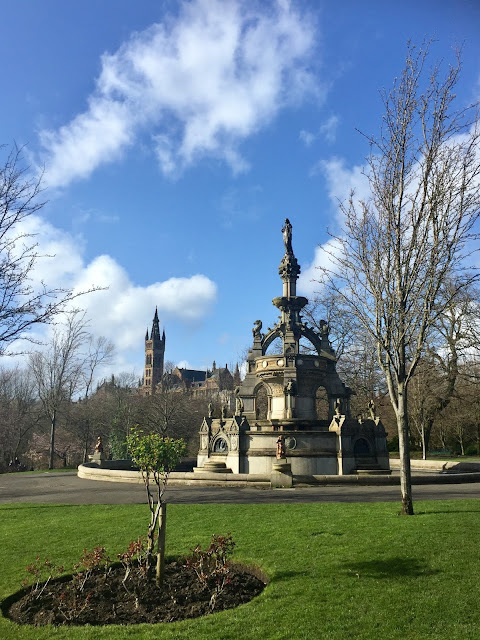 The Glasgow Stories area interested me a lot, as much of my historical knowledge is based on Edinburgh, or larger events in Scottish history, as that's what I talk about at work. I liked the Cultural Connections exhibition too, looking at different world cultures, and there's a whole section about St Kilda, a remote Scottish island where a community lived for years with no contact from the outside world. The Scottish Identity in Art room was also interesting, as it looks at images of famous Scots, and how they might differ to the realities, with our tendency to romanticise the past. I liked some of the French Art too, since it features the Impressionists, one of my favourite movements. 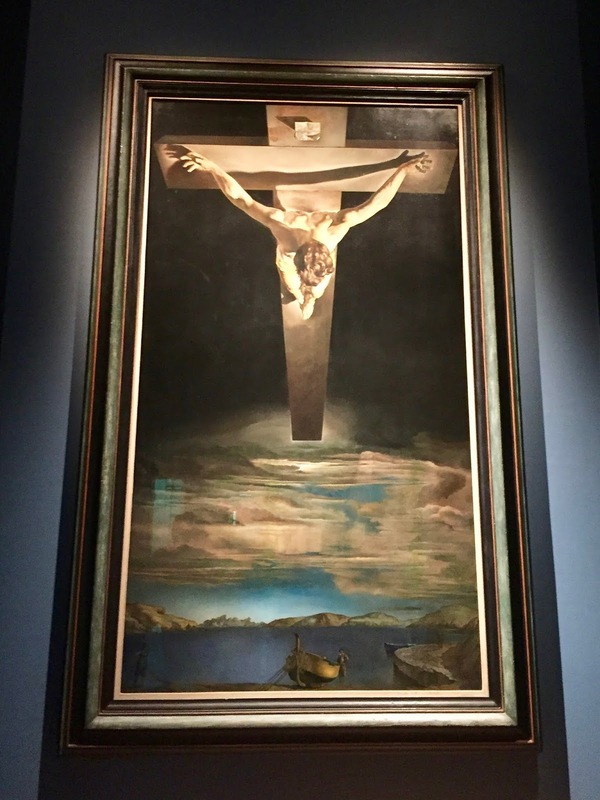 They also have Salvador Dali's 'Christ of St John on the Cross' in a corner room by itself. He is one of my favourite artists in general, though this is a less surrealist piece than most of his other work, but I still marvelled at it for a while. Other rooms were less my cup of tea - the wildlife exhibitions are interesting, but I don't want to look at stuffed animal models all day. Ancient Egypt also interests me, but there's too much history there to cram into just one exhibition! And of course, everyone has different tastes in art, so likes of the Scottish Colourists are just not for me, and Mackintosh's design work is nice, but a lot of it is furniture and other items, which honestly, bores me after a while. There were a lot of important message throughout the exhibitions though, which is why it's also a good place for children to explore. For example, looking at how humans caused some animals to go extinct, and the importance of saving our local wildlife, or the effects of warfare in the 'Conflict and Consequence' room. So even if I didn't love every part of the galleries, I can appreciate their importance. I think that's what's so good about the Kelvingrove, is that there's something for everyone. 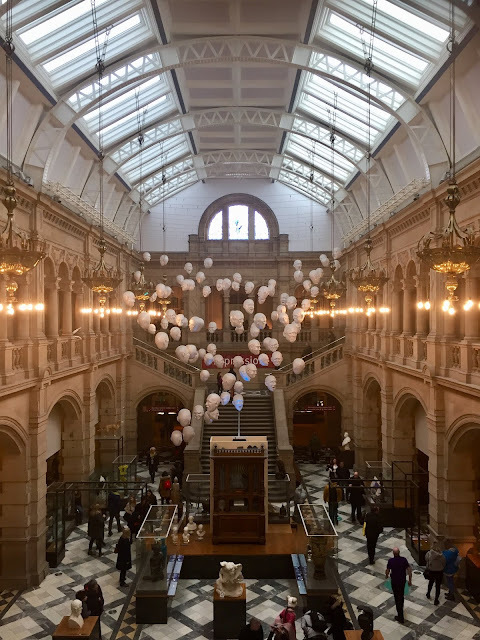 You don't have to be interested in all the exhibitions, but there's a good chance you'll enjoy some of them, and at least understand and appreciate the others that perhaps don't spark your interest so much. It's fascinating just how diverse the exhibitions are. At first, it might seem like a somewhat random collection of topics, but it makes for a unique, exciting visit, as you switch from one to another! And of course, Dippy in the centre of it all made the whole day even more worth it. 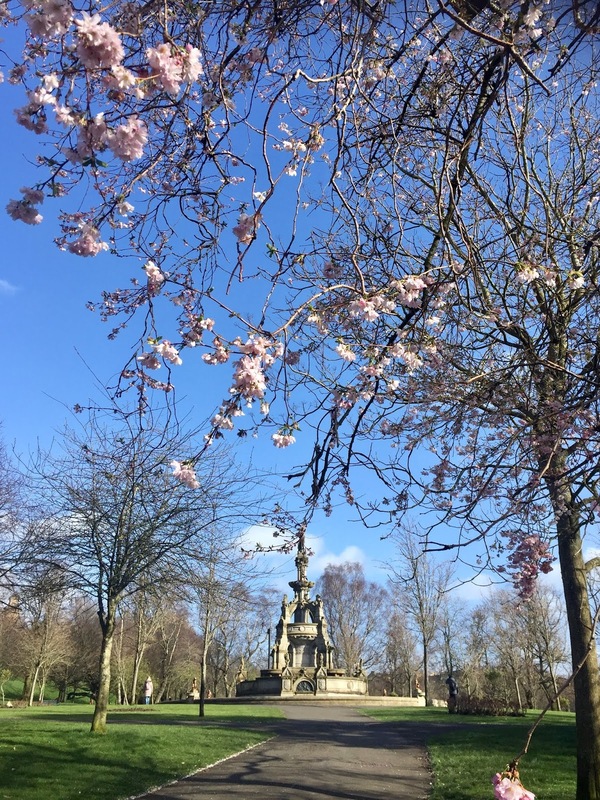 Plus, on the walk (30 mins) back from the Kelvingrove to the city centre, to catch my train back to Edinburgh, I went through the neighbouring park. Spring is just arriving, and the sun was out, so I lingered a while, taking photos of the blossom, and the University of Glasgow building on the hill in the distance. Nice little ending to my day out!